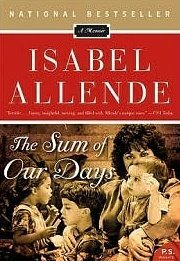 I received The Sum of Our Days by Isabel Allende as part of Book Club Girl’s blog radio show with the author, which can be heard here. Give it a listen. It’s really good. In The Sum of Our Days, internationally acclaimed author Isabel Allende reconstructs the painful reality of her own life in the wake of the tragic death of her daughter, Paula. Narrated with warmth, humor, exceptional candor, and wisdom, this remarkable memoir is as exuberant and full of life as its creator. Allende bares her soul as she shares her thoughts on love, marriage, motherhood, spirituality and religion, infidelity, addiction, and memory—and recounts stories of the wildly eccentric, strong-minded, and eclectic tribe she gathers around her and lovingly embraces as a new kind of family. I really enjoyed reading about Allende’s family. She talks of many challenges and doesn’t hold back when it comes to giving her opinion. She’s frank and honest and I admire that. Writing about your own family cannot be easy. One thing that really moved me is that she addresses Paula, her daughter that passed away, as if she is still there. As if she is just filling her in on what has happened since her illness. I was so touched by this. I thoroughly enjoyed reading about the family members and how they called themselves a “tribe”. Their strength and loyalties came through for me. Reading this book was like visiting a very close-knit family at dinner time. Warm and inviting. I’m also glad that she shared some of the writing process with her readers. I am always fascinated with the creation process. Overall, it was a satisfying memoir and memoirs are not usually my thing. I listened to the chat and loved it. I hope to get the book soon. Good review Ti. I’ve heard a bit about this book. It does sound like it would be a good memoir and those aren’t always my thing either. I’ve heard so much about this book since Isabel Allende’s Blog Talk Radio show. I need to read it! This is high up on my wish list! I love personal memoir, and enjoyed one of Allende’s novels (I read *Daughter or Fortune*).I haven’t listened to the interview yet, I’m afraid of spoilers! I’m a huge fan of Allende’s fiction but I’ve never read any of her autobiographical works. They are definitely on my wish list though!